So I have developed a "thing" for paper garlands this year. After I made the circle and tree garlands I made these extremely cute gingerbread men. This is made from a free cut file I downloaded from svgcuts.com. The gingerbread man svg cut file can be downloaded here. All the shapes where cut from my Silhouette and glued together. Once assembled, I punched two small holes in each little guy's forehead and thread them onto a piece of dark green yarn. Then I taped the strand up on my fireplace. Having threaded the gingerbread men I was able to move them around on the yarn once hung to space them (more or less) evenly. It was going so well. 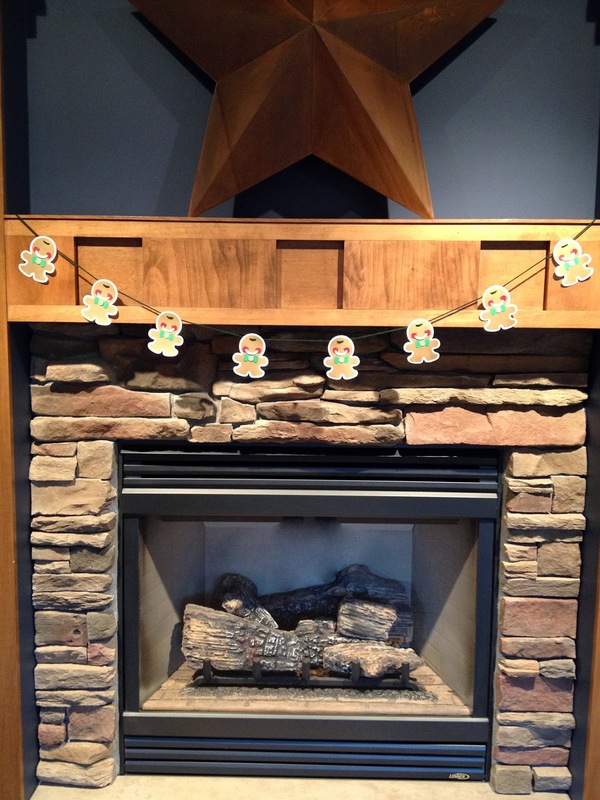 But once I got the little guys up on the fireplace and they looked so lonely. They needed friends. Or in other words; they were a good start but the large fireplace mantel needed more. So this is what I did. It makes me happy looking at it! First I cut out some red candy canes. Then I painted the white stripes on the candy canes with my daughter's craft paints. Who needs fancy and expensive! Next I added some black emphasis marks with a thin point sharpie. The candy canes looked good but I wanted to add some green to the garland so I cut out some bows with my Silhouette from the bow files that came with my Silhouette. Once the candy canes were completed I used a simple needle and sewing thread to string them together. Then taped them to the top of my fireplace mantel. The gingerbread mean and candy canes were looking good together but a third garland was needed to really complete the look. And since I had stumbled into a Christmas sweets theme, I chose to add a strand of peppermint candies. Ok maybe peppermint are not exactly Christmas, but the color and theme was correct. I downloaded the peppermint candy cut files for free from www.wecanbeaoriginal.com here. So here is the finished fireplace in our lower level. But that got me looking over the fireplace upstairs with that lonely Christmas tree garland. It too needed more. This is an even bigger fire place! (You can tell from these pictures that we have since done the rest of the Christmas decorating). My first step was to cut out these super cute Christmas stockings using several different Christmas papers. Then I again used a needle and thread to string them together. The stockings were the Silhouette Store's free shape of the week last week. I made two sets of a sleigh with eight reindeer. My daughter wanted the lead reindeer to be Rudolph. I should have made nine reindeer for each set but Rudolph was an after thought. Perhaps Rudolph is filling in for Prancer or Comet. Here is the finished mantel. Now I need to start shopping! Don't forget to follow me on Facebook and Pinterest. WOW. Lots of work, but it all looks wonderful. These are great! Thank you for sharing!! I'm a new FB follower stopping by from the Inspiration Monday linky party! Thanks for stopping by Christy! Glad to have you along for the ride. Thanks for stopping by Marty! I am working on paying attention to little details around the house. It is an interesting perspective. What a beautiful fireplace - the first one. I hear a lot about the Silhouette machine. I keep debating about it. I'd love to create garlands like yours for the different holidays. Thanks for sharing your post at Motivation Monday! Hi Barb. Thanks for stopping by. My Silhouette has become an "addiction" for me. But since I cannot cut a straight line is has also become a workhorse. And given the cost of a new computer, phone or tablet, it isn't terribly expensive. I saved up for a little while for mine and am so glad I did. Welcome Agnelique! It is great to have you here. I will hop by your blog and have a look around. Everything looks great. Great job! Thanks for sharing at Thursday Favorite Things Blog Hop. Hi Angel. Wonderful to have you stopping by! too cute! Love both sets and so festive :) Thanks for linking up to Momma's Meandering Monday! These are absolutely adorable! These are definitely something I would do, I prefer the simpler and less flashy kind of decor. I think it adds a bit of that innocent fun from childhood. Thanks for sharing with Meandering Mondays! OMG! These are adorable! It definitely adds a special flair to the holidays, and just so creative! Thanks for leaving a comment Natasha! I have been lurking on your blog for awhile and must say your posts about raising your son just ring so true to me. Have a great day! How cute! 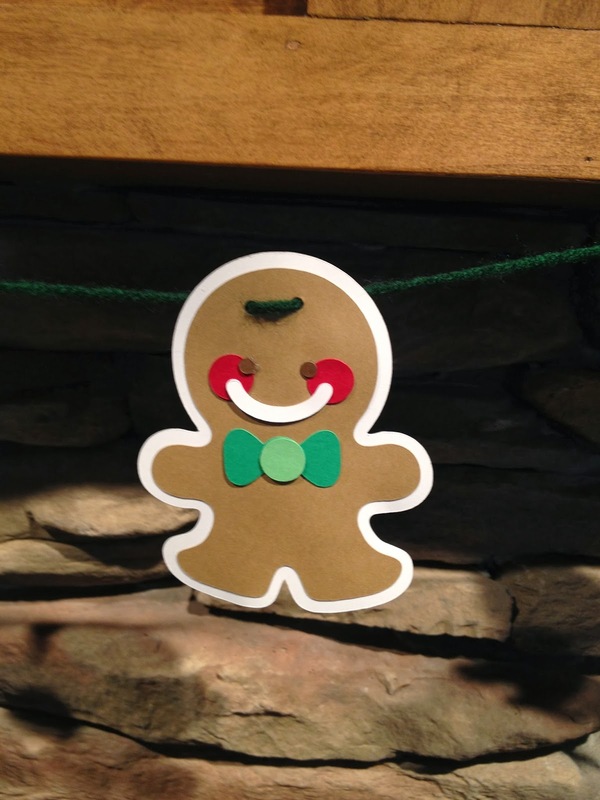 Gingerbread men and candy canes are my favorite Christmas decorations. Love yours! They were so fun to make. Thanks for stopping by. This bunting is absolutely lovely, definitely my favourite that I've seen this Christmas.